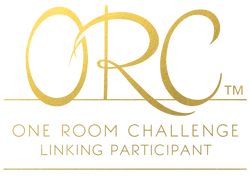 Welcome to week 5 of the One Room Challenge. If you missed the past four weeks, you can catch up here. This week actually made me feel like it will actually come together next week to be a successful ORC. I mean its still a smidge skeptical that it will happen, but I see hope in my future. I have always thoroughly enjoyed the ORC because of the amazing experience it has provided for me and the amazing rooms it allows me to create!! But I need to be honest, this room has kicked my arse! 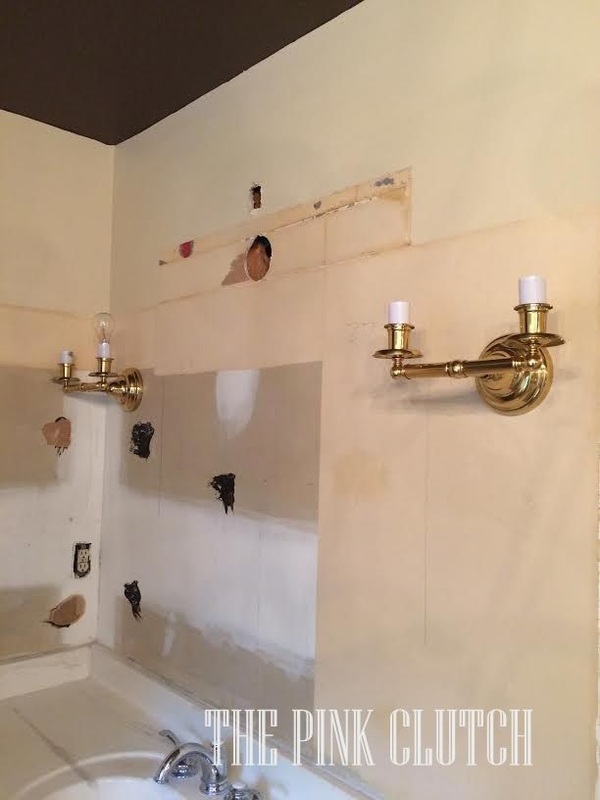 I don't know if its the things I have going on or the fact that its a bathroom and they are super crazy to complete, but dang, I am struggling! 1. Remove carpet from bathroom (yes, vomit! I have carpet) and replace with sea grass. 13. Skirt vanity area ... ordered! 17. 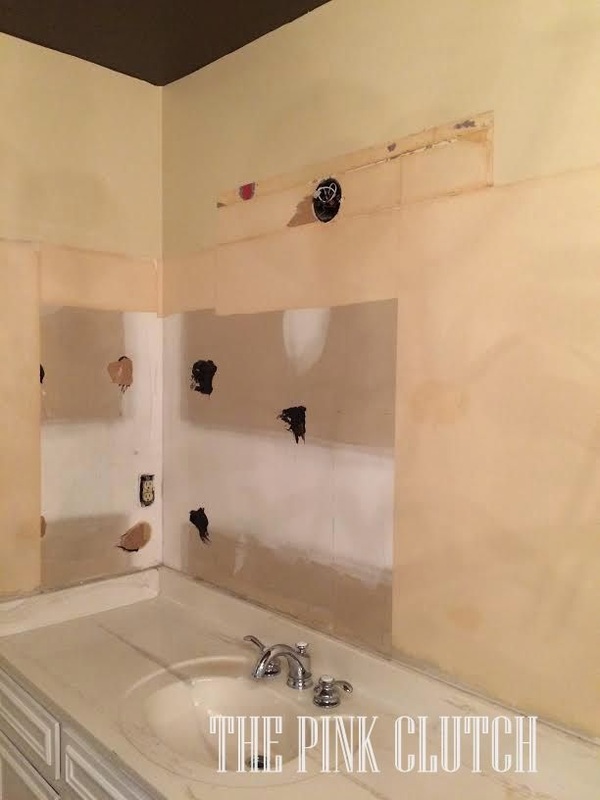 Add custom cabinet to my counter area to break up the extra large counter - SCRATCHED! Ok, so maybe this is working and it just doesn't feel that way because the wallpaper is the very last thing to be installed. And I am sure you came this week to see my wallpaper hung. And it will be, it gets installed on Monday, but I didn't think I could hang it until the walls were painted, and the mirrors were hung, and the lights were installed and I decided where every single thing would end up and hang. I was not willing to get any paint or extra holes any where in my fabulous new paper. Sigh ... just a few more days and the reveal will be amaze!! First of all the ceiling is now chocolate!! Yes, the old valance is still hanging, but I needed to make sure it wasn't gonna get jacked up before I could rehang. It's getting moved tomorrow, pinky swear! 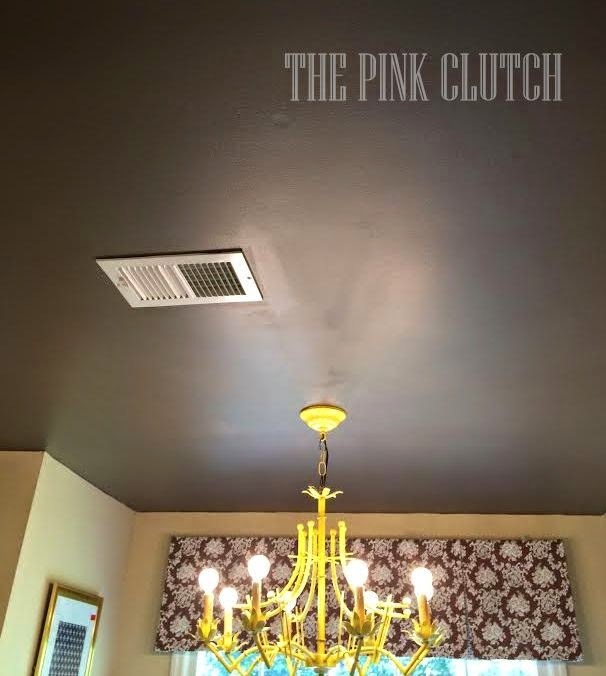 I absolutely love the ceiling, love it. And I can't believe I ever doubted painting it chocolate. It's bold and its amazing!!! The shower curtain I designed from a sheet set is done and it is sooo good I can't even stand it. Its so amazing that I ordered a valance to look the exact same way. Well, the ruffle would be at the bottom, but you know what I mean!! 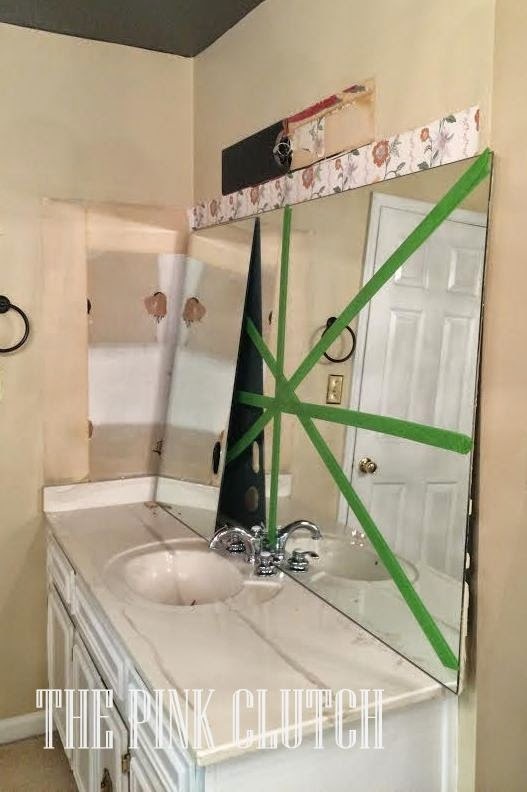 Old nasty mirrors are down and ready for the dumpster! So much easier to remove than I had pictured in my mind! Taped, pulled and yahooooo!!! they are done!! Isn't it already so much better? New sconces in place and ready for their amazing shades! They came with black shades, so I need to make a trip to my favorite lamp store for some white ones, but other than that they are perfection!! 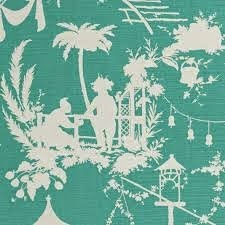 Exactly how I imagined them and I think the stripes off the turquoise chinoiserie will be divine!! Already styled the water closet, and I could check it off the list ... except for the valance and a new trash can. And don't you love the light switches? 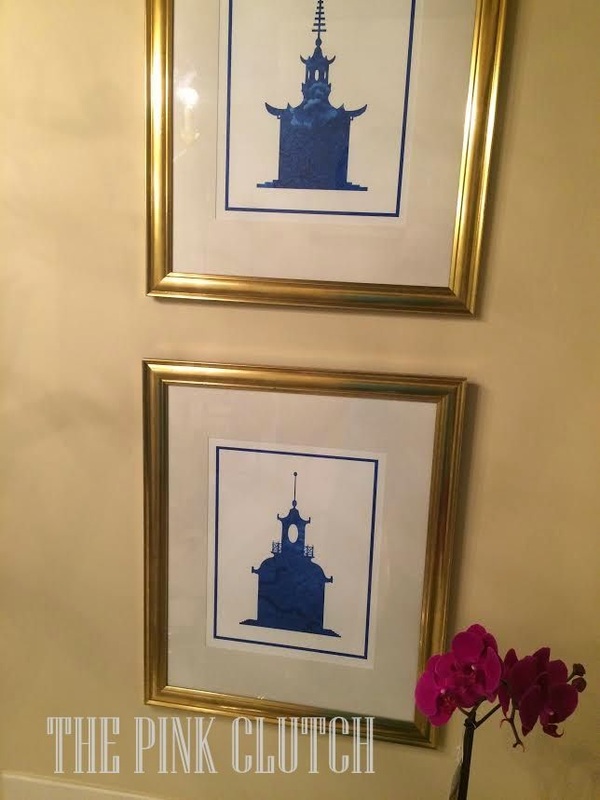 I saw them at Lance's and instead of stealing his I ordered my own from Etsy! 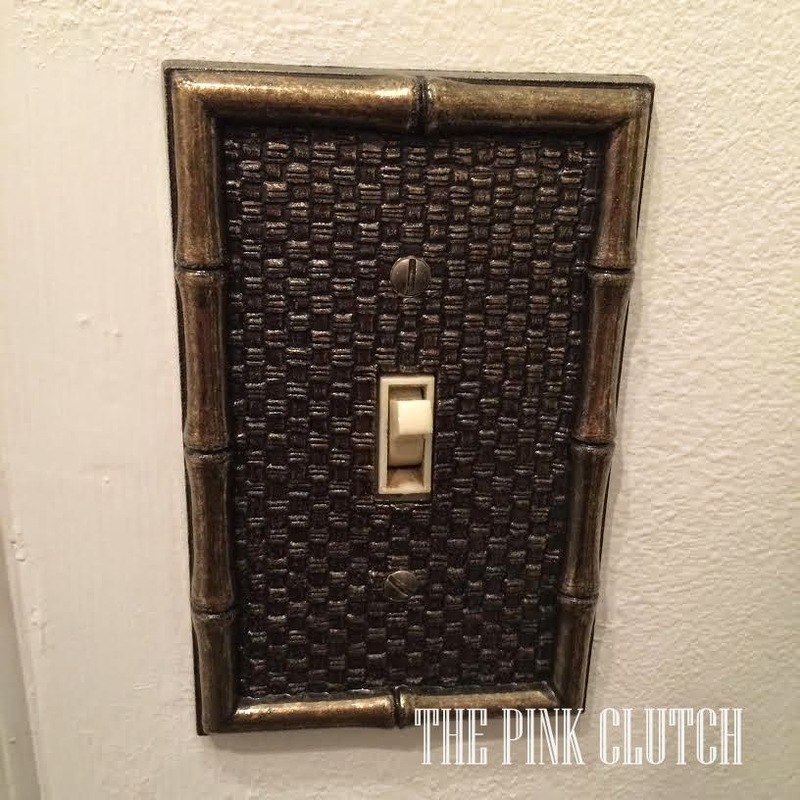 He has them all over the master bedroom and bathroom and I immediately fell in love! I just adore them!!! And last, but certainly not least ... my artwork! 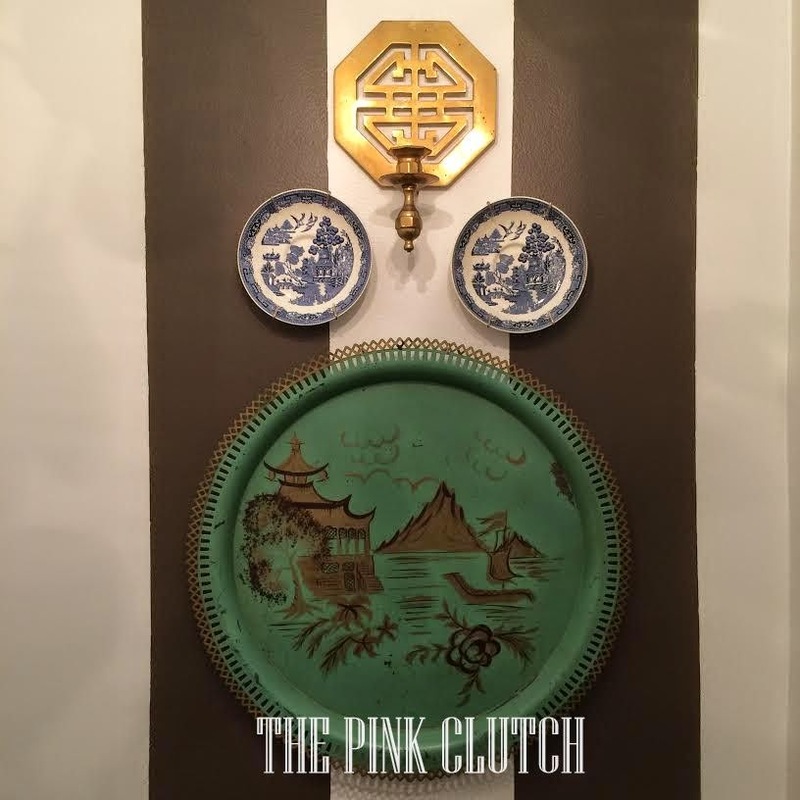 These amazing pieces from The Pink Pagoda literally make the space. I know they are still on boring painted walls, but picture them on the wallpaper and it is over the top good. Jennifer was so kind to help me chose these over the phone. She looked at last week's post with me and chose the pieces that she thought would be absolutely perfect for my space. I can't wait to finish the space and fill next week's post with nothing but eye candy!!! Until then catch up with my amazing linking partners here!! I never would have thought of any of this in a bathroom, but I love it! It's all coming together just beautifully!! Can't wait to see the final reveal next week. I love the colors and all the Asian influence. I'm amazed at how much you have accomplished!! And at your creativity. I would never be able to come up with it, but absolutely adore it!!! Cannot wait to see the final reveal! Oh man, so good, all of it! The wallpaper is going to be amazing, I can't wait to see this next week!!! This is going to be sooooo stunning. It already looks fantastic with all the teasers. 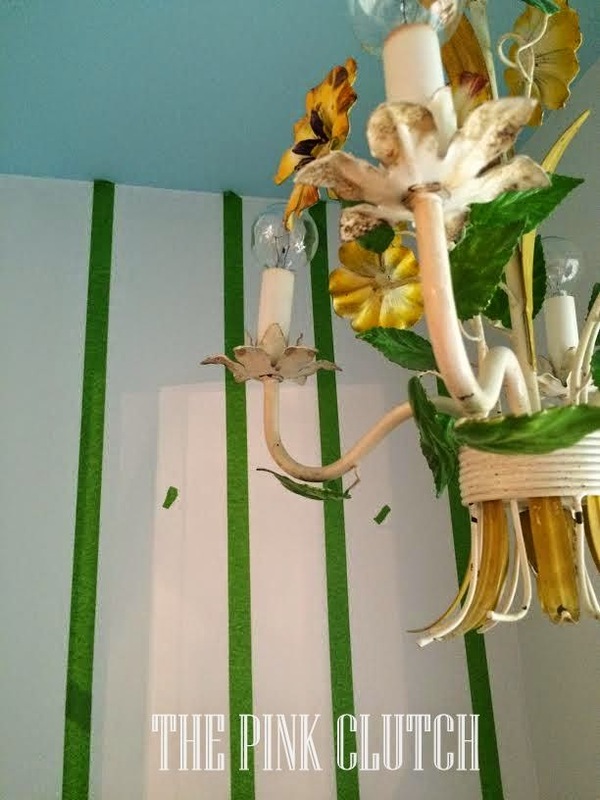 Stripes, chinoiserie, and wallpaper. Girl, you got my heart. Just FABULOUS! That is all. 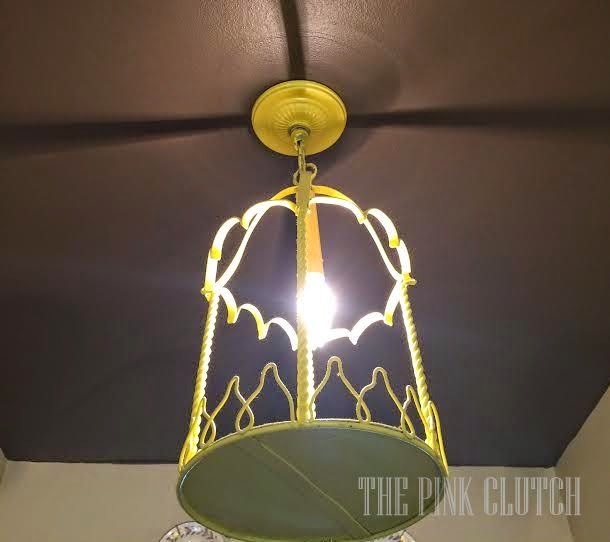 Wow, Paige ~ love how all your details are coming together and that ceiling is awesome! LOVE the stripes in brown with the hint of blue on the ceiling that will tie into the aqua paper with the brown ceiling- perfect, perfect. Can't wait to see your reveal!!!! Well, it sure doesn't look like you are struggling to me! It looks amazing! Love the striped walls and the ceiling...now give me the wallpaper! :) This is going to look fabulous! Good luck in our final week!!!! Aghhhh!! yummy stripes, i love them! Can't wait to see the reveal next week!! I so need to see this one up close and in person girlfriend ;-) AMAZING!!!! Can't wait for the eye candy next week! You have wet my appetite! The stripes are striking! Wow, you've done so much. Looks amazing so far! Paige, you are SO AWESOME. I was thrilled to get to chat with you and help you with your prints! I'm dying to see them on that wallpaper OH MY GOODNESS. Everything you're doing looks gorgeous! 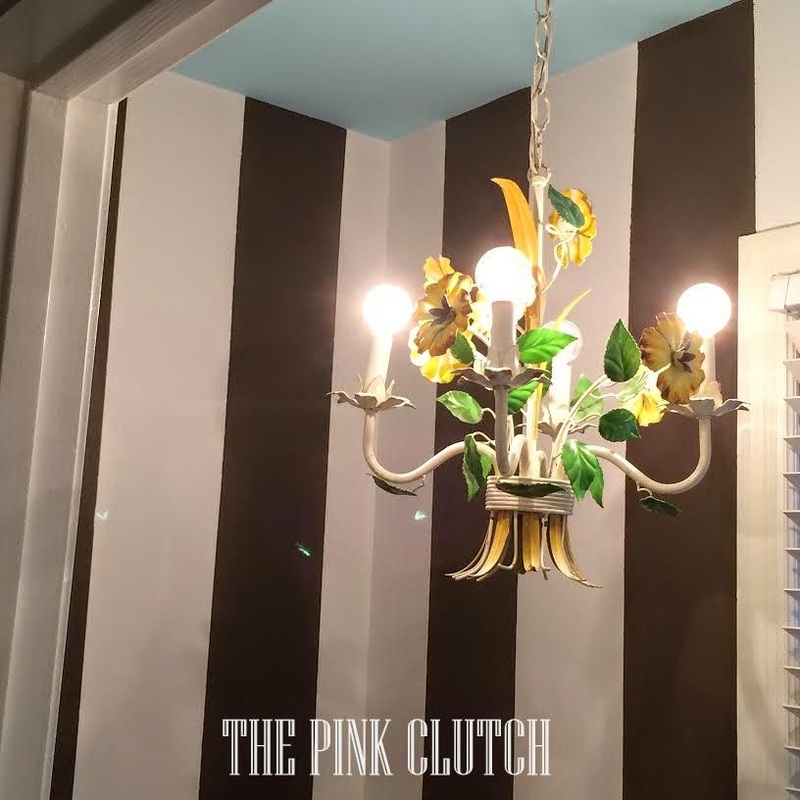 The wallpaper and the chandy are everything! Kudos. Those stripes!!!! I LOVE THEM!!!!! And the styling too. 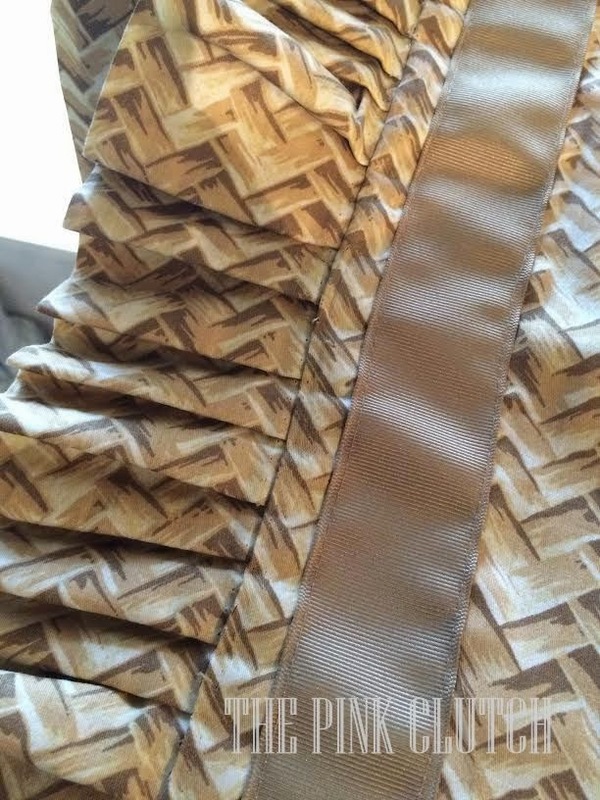 Crazy good, and I adore brown and white.. You are over the top on this and I can't wait to see it next week. The ceiling is great! And the chandeliers are beautiful. Can't wait to see the reveal! This is looking AMAZING Paige! I can't wait to see it next week! Looks great and cant wait to see the reveal!! Love the artwokk in that space from TPP! Is it wrong that I want to hang out and have drinks in your bathroom?! :) LOVE!! !